I prefer the original link sprite a lot more. I commend the attempt to change it but it's just not my thing. The New Link Sprites are good. I like Revility's Rev Edition sprites even better. I second Revility's sprite. A longer sword is fine once you get a feel for the hit boxes and it overall looks much better and more inline with other Links in the series. All the other swords kinda look like little knives, daggers or gladius' and I prefer Link with what looks like more of a sword. Though correct me if I'm wrong, but I think all of the Redux betas should already include the "Restart from palace at Game over", don't they? That was one of the features right from the start, can anyone please check if both the normal beta in OP and the newest Beta 2 in page 17 have said feature, please? 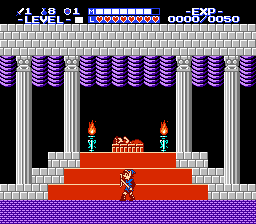 I'll have to redownload the beta 2, but all the other versions did have the restart from the palace. I just tested it now and both hacks already have this feature, I'm sorry. But the last patch with the three hacks provided above has a glitch in the swamp areas, it's the same conflict of different graphics that you solved with Redux + Rev + NewLink.ips and that I had not checked so far. Here in this link the fix if you are going to use Redux beta2 and Rev Edition together but still with the swamp areas problem, if you can work on it after your vacation I will be very grateful, this patch can be applied in all the updates of the other hacks. Thanks for those points, Trax! I might drop the extra dots between the names of the spells and the actual numbers, just to make the Pause pane look cleaner. Sounds logic. I will check the spell consumption rates and make them either end with 0 or 5 instead of odd numbers. Huh I'm not sure which bot that is. Do you have a pic of the bot in particular and/or what room it is located exactly to debug it properly? Mmm yeah seeing as it is pretty early in the game, maybe an Exp reduction wouldn't do any harm and balance things better. Yep, that's the only change remaining to properly make the new HUD a thing already. Just the white magic square. I will try to address those issues this week, might have a new beta ready by Friday hopefully. @ShadowOne - Each magic container is a total of 16 points for an overall total of 128 with all 8 containers. To take the magic use see balanced, you should use multiples of 4, 8, and 16 for your spell usage and not 0 or 5 unless the zero falls into one of the multiples like 20, 40, or 80. If 1 magic container is 16, then 2 is 32, 3 is 48, 4 is 64, 5 is 80, 6 is 96, 7 is 112, and all 8 is 128. Now, if you find a way to increase the max number, I'm all ears! LOL! Also, you still need to fix the HUD display as well. I know that's at the top of you list. As a suggestion you or Trax can try is to implement a map of the overworld you are in when you pause the game on the overworld. That would be great. I do not work on ROM hacks... Please don't message me for anything. Awesome hack, ShadowOne333. Eager to play this when it's finished. Well I already have the magic consumption that way, in multipliers of 4. Every magic has some number which is a direct multiply of 4, so that's how it already is. Odd numbers are basically those that don't end with a reminder of 0 when divided by two. In other words, any number which ends in a 1, 3, 5, 7 or 9. 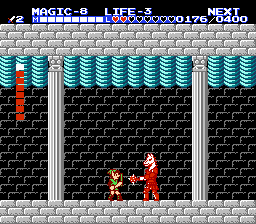 I already fixed the wrong tile in the JUMP spell tiles, next up should be the Bot which apparently gives a whole heart of damage in the First palace. Anyone knows which Bot this is specifically? I still haven't found that enemy yet. It's not a specific Bot, just the enemy type itself. For enemies such as Bots and Bits, I'd expect a half heart of damage at most. There are 3 parts to the exp counter. Part 1 and 2 are the green highlighted portion, and part 3 is the red. The yellow highlighted portion is what you see in game, and purple is what I did for Shadow of Night. Part 1 is at 0x1655. This line of code is the entire green portion of the screenshot. 6E is the position in the HUD, and 10 (16) is the length of tiles. So without having any digits in the exp counter, you would only see 0000/000. Those are static tiles. Part 2 is the actual position of each digit within the above range of tiles. 0x1769 - Position of tens digit for current xp value. 0x176E - Position of hundreds digit for current xp value. 0x1773 - Position of thousands digits for current xp value. 0x1777 - Position of ones digit for current xp value. 0x1789 - Position of tens digit in required xp value. 0x178E - Position of hundreds digit in required xp value. 0x1793 - Position of thousands digit in required xp value. The tens digit in the required exp is the LAST digit within the counter. There is no ones digit since it is never used. If you try to move a digit outside of the counter's range of tiles, it won't be visible. Part 3 is at 0x1D101. This line of code is the red potion of the screenshot. It is a static string of tiles, and its only purpose is to have a ones digit in the required exp. It sits behind the actual exp counter, and looks like this /0000 in game. 7A is the position, and 05 is the length of tiles. What I did for Shadow of Night is the purple highlighted area in the screenshot. In that hack, I never used the ones digit OR tens digit for required exp. I sacrificed the tens digit by moving it out of Part 1's available range of 10 (16) tiles. 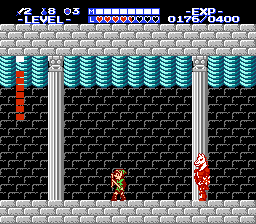 You probably don't want to do that, since Zelda II uses the tens digit for required exp, so your only option is to relocate the data in Part 1, and extend its range of tiles to 11 (17). Then you could freely moves all digits of the counter one space over. As for the white tile in the magic meter, if I remember correctly, all I did was open Tile Layer Pro and moved the actual white square up one space. It made the boss health bars have an "empty" space between their remaining red bars and the white bars. It wasn't too big of a deal so I just left it, ha ha. I'm pretty sure that's how I did that, but I'll check to make sure. There is definitely a better way to do that. That write up is really nice, IcePenguin! I think I tried to do something in the vein of relocating the data found at Part 1 (0x1655) to some other place. However, I think the only pointer or call to that particular section of the ROM is located at 0x173E, with [BD 41 96] or LDA $9641. I tried to move the data around to some other place where I could write additional entries for that code, with something like [20 6C 11 F4 F4 F4 F4 F4 F4 F4 F4 F4 F4 F4 F4 F4 CE F4 F4 F4], but for some reason I kept getting glitched tiles when trying to place the data somewhere else and changing the [BD 41 96] correspondingly. Maybe I didn't make the repointing as it should have been, but I'll try again just in case. 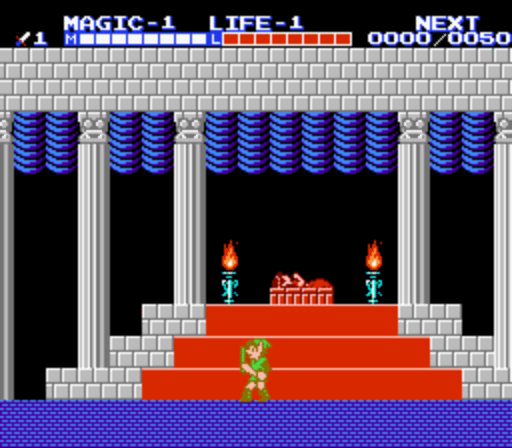 I'll also add a data comparison between both the Original Zelda II and Shadow of Night. Maybe this can help for others. As for the white tile for the Magic meter, it was just through tile editing? I opened both SoA and Redux in YY-CHR and the white tile is basically the same in both, so I'm not sure if that one is entirely all just tile editing, it could be something else, maybe one opcode which determines the Y position of said tile. Thank you so much for dropping this info, IcePenguin, even though you didn't have the notes at hand, you took your time to recreate the hack. I really appreciate it, thanks! Here is a solution. Pulled it off with no glitches, and seems to work fine! You can test it more thoroughly if you wish. Change the pointer at 0x173F from 41 96, to B0 A8. At 0x1747, change the value from 18 to 19. This is probably why you were experiencing issues with simply increasing the range of tiles from 10(16) to 11 (17). The Life counter was taking into consideration the length of bytes from 0x1651 to 0x1668. (which is the life counter, health, and exp) So you have to extend that, as well. I could be wrong on if that's actually what the game is doing, but just from looking at it, I'm pretty sure it is. After that, move all digits in the exp counter one space to the right. Oh, and also move the static string of tiles at 0x1D101 one space to the right. The byte at 0x1747 is the one that was giving me issues, that's why I couldn't get the tens digit to show up. I also had to change the byte at 0x1788 from 0x1B to 0x19 so that the number in the tens shows up properly too. Also, I had to change the pointer to somewhere else in the ROM, somewhere near the tunic changing routine I made, at $AB50, or PC address 0x2B60. To move that white tile (which is the one that moves when you use magic, the tile that tracks the magic consumption) up one row, while retaining the red one for the hearts in the same row. Thank you SO much for your help, IcePenguin, it is really appreciated that you take your time to recreate all of this from scratch. Happy to help when I can! Took another look at the white magic tile, and for Shadow of Night, I simply moved the tile up through tile editing, and also moved it with its X position value. The side effect is having that "empty" space in boss health bars. If you fight a boss in Shadow of Night, you'll see what I mean. The top row of tiles is original Zelda II. The bottom row is what I did in Shadow of Night. 0x1699 - Tile used for sliding magic tile. 0x169A - Tile used for sliding health tile. 0x169B - X position for sliding magic tile. 0x169C - X position for sliding health tile. That is one solution, but comes with the empty space side effect in boss health bars. I'm positive that is the only side effect, and for me, doesn't seem like such a bad thing. The obvious better option is to locate the Y position for this tile, but I'm willing to bet that the sliding magic tile and health tile share the same Y position. If you have any extra gfx tiles to use, you could make a new white tile for the boss health bar and have it use that instead of sharing one with Link. Or just make a new one for Link. Either way. Here is some data on the boss health bar. It would be a good solution and have no side effects. 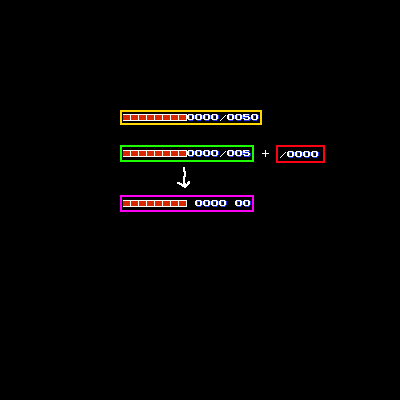 0x11C64 - Y position for boss health bar. 0x11C68 - Tiles for empty white tiles in boss health bar. 0x11C6D - Tiles for red tiles in boss health bar. 0x11C72 - Palette used for boss health bar. 0x11C77 - X position for boss health bar. WHAT KIND OF DARK MAGIC IS THIS?! So what happens is that when the first red rectangle of health is deplenished, the white tile appears one tile above where it should. That's all. I'll see if I can manage to find some suitable empty tiles for each one, hopefully that doesn't change anything else graphics-wise in the game once re-implemented.